I'd like to give Serpico (the user) a chance to rebuttal against all the allegations made in the 282 thread. So here's the gist of what has been said already. Well, despite that fact he is actually a more skilled fighter than most every legendary hero in the Berserk universe I am definitely not saying he would or even could win. I think the reasons I want to see them spar are obvious though. Their styles match; appear before the enemy swiftly and behead him in a clean stroke by the time he sets eyes on you. Serpico's human ability is superior to Griffith's, and Silat's. With his control of the wind growing as well and his speed with it, I don't think its any strech to say he could cross blades with Griffith longer than anyone other than Guts or some of the stronger apostles. I also see Serpico as the most likely character to be completely impervious to Griffiths charms. Even if it means he must die, I want to see that fight happen. I'm not getting into this again. I really think your username and obcession with Serpico just maybe, now bear with me, MAAAAAY BE clouding your objective judgement here. How do you know he's more skilled than "most every legendary hero"? Did you see him fight with Locus, Grunbeld, Gaiseric, Azan, AOLSIER, Zodd, Griffith or Skull Knight? No? Well, add onto that that Serpico uses a rapier, Griffith uses a sabre. So... what do they have in common again? Oh yeah, they both kill people fast. Just like Guts then, yeah? Future comments on this subject should be addressed in a new thread. You can even quote what was said here so you don't have to start from scratch. I just don't want these hypothetical VS concepts crapping up the new episodes thread. Anyway, I'll concede Serpico being the most skilled fighter ever of all time, why he could cross blades with the "untouchable" one as long as anybody (which might just be a tie for 0.0 seconds), if you can explain why he's likely the most "completely impervious" to Griff's supernatural charms? I mean, Guts seemed pretty resistant before, with good reason, and Schierke knows the score too, so far Skull Knight hasn't bowed down either. I just don't see how Serp is a more qualified candidate to resist, especially since he already knows Griffith by his fame and expressed admiration. I mean, I guess what you're basically saying is he's above God on Earth, right? Bigger than Jesus? Yeah, sounds like a fair and balanced assessment of his character to me, especially when he can avoid being hit by Makara snot. Basically, there's no facts that definitively prove anything here. But personally, I'd rate regular old Griffith ahead of Silat and Serpico, because he managed to do something to Zodd only Skull Knight has duplicated, his only defeats came at the hands of Zodd and Guts, and because of his overall demonstrated formidability (I think people tend to forget this and remember how things ended for him). As for Serpico to Silat, I certainly don't think one could say Serpico is measurably better with any authority, especially since it's hard to directly compare them. And honestly, I think that's because Serpico is somewhat physically overmatched, as he is with Guts. Currently I am interested to see Griffiths abilities like everyone else in the thread, the Serpico vs Griffith thing was just a repricussion from the possibilities of what Griffith does next vs Ganishka. Maybe only I care if it is viable on this board but I know plenty of Berserk fans personally who are interested in that too. I'm willing to bet Boscone could beat Serpico. Thank you. I appreciate the opportunity. Since so many people want to chime in I might make a comprehensive thread later. I have a bit of a headache right now. Rather than point by point rebuttles I will just explain myself a little more reasonably. One thing I would like to point out, by "legendary hero" for one, I did not mean he is as strong as Guts, Grunbeld, or Zodd. There is a lot of these "legendary" guys in berserk, for instance, the big guy Bazuso which Gatsu killed when Griffith first took note of Guts, who had supposedly killed 30 men. Then their is Azan the legendary bridge knight I think who held off 10 men. Even Caska was somewhat legendary. I am going out on a limb saying Serpico could beat these people, and that their are more like them. Even Guts himself who has killed many legendary people notes that Serpico is exceptional so I find it a plausible theory. That is where I came up with the statement "despite that fact he is actually a more skilled fighter than most every legendary hero in the Berserk universe". "Many" may have been a better choice than "most" though since their is so much unknown. I think Grunbeld and The Rhino General are stronger than Serpico. After that I generally lump human Griffith, Locus, Irvine, Silat, Serpico, and the Tapasa together as the next best human fighters. As such I like to consider Vs for Serpico out of this pool. He is defintely not above a god-hand however I just don't think Griffith would attack Serpico with the same power he displayed against Zodd. Just as he killed Ganishka's guards with his sword, I think he would fight Serpico in that manner. This is pretty much what I was getting at. In response to WHY I think Serpico is impervious to Griffith, its fairly simple; he cares about Farnese above all else, and I don't think even Griffith can take that spot. Nothing magical. On some points I will concede. Silat's attacks may work better on Serpico than they did on Guts. Also Silat has no doubt trained and battled a great deal since Guts humiliated him. I like him quite a bit so I am not that biased. I said Serpico was better because Silat was beaten without a weapon. I know Gatsu didn't have a weapon on the cliff vs Serpico, but he did try to use bombs and Serpico was hardly beaten, that was actually a close call for Guts too. Thinking about it a little more, I think Griffith and Serpico are too close to tell discounting Serpico using any devious tactics. Serpico did actually cut Guts when it was just sword to sword out in the open, but it was a sneak attack unlike Griffiths attempt. I am going to maintain that I want to see them fight, and think it could be a good show. As I said in my PM to Walter, Its the fact Serpico can die that makes it interesting to me. He is obviously not the strongest player on the field, but I do like his cunning and bravery. He even stands upto Guts. And about the Makara, those things gave Guts a bit of hell too. I agree, I actually mixed the names up. I meant Adon actually, and Samson. Boscone probably could have beaten Griffith as well. I don't have anything against the guy, I like Serpico a lot. But you're really putting him in the wrong place by pitting him against the most powerful creatures in the Berserk universe. That's not his role - nor his place. What situation would present itself where Serpico would duel with Griffith? It's the realm of pure fanfiction. Cunning matters in battle though as much as talent with a weapon. Azan had the same opportunity to see Guts weak spot. Serpico saw it and exploited it immediately. I can't really see Azan being able to handle Serpico as Guts is able to, which could easily mean death with a single slip up. As far as the scenario where they fight, here is one possible that I think may happen. Zodd seems dead set on not allowing Guts to fight Griffith without going through him. 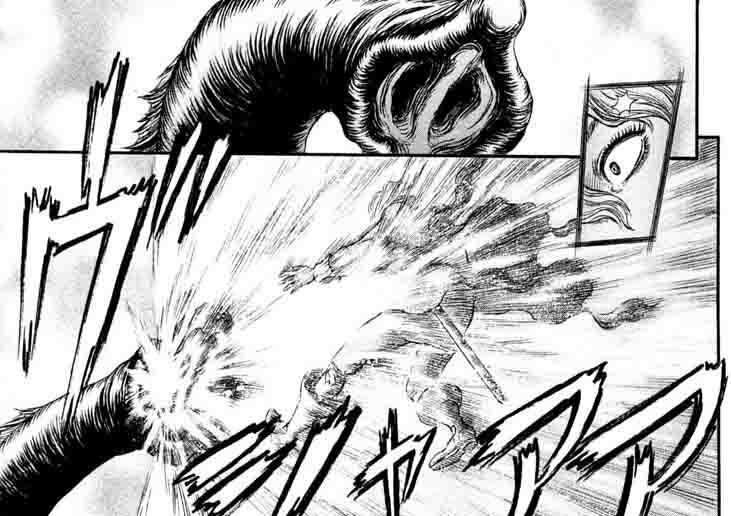 In a situation where Guts and Skullknight are busy fighting Zodd and Grunbeld, what if Griffith approaches Casca who is likely right beside Farnese? I can definitely see Serpico blocking his path. This is all speculation. But it may not be unreasonable that Serpico could have a fighting chance against Silat. From what we've seen, several of Silat's weapons can be fended off by strong air currents (From a swing of the DS when he fought Guts), and that would be Serpico's specialty. Serpico also has the benefits of his cloak, which improve his general agility and hide such suprises as what I guess is temporary flight. That said, I dont think he has a prayer against most apostles, and while he may have had a chance against the pre-eclipse Griffith due to his magical items, Im fairly confident that Griffith reborn is FAR out of his league. The only things he's really killed effectively so far are trolls, croc familiars and to an extent, Daka. Things that Guts goes through like he was picking daisies (if he could could pick 5 at a time). Sorry Serpico (the user), but I dont think its feasible to think that he could do the things you claim. First, Serpico (the character) is used to one-on-one duels, not fighting many opponents at once. As long as he only has one enemy in front of him, he is definitely to be feared. Second, until Serpico actually starts flying around and cutting through buildings, I don't think that his skill with the wind elemental gear is a decent argument. It definitely gives him an edge against Daka and Familiars, but as far as the stronger apostles and the God Hand, I don't think it would make a noticable difference. As for Serpico beating Silat, I think it's likely that Serpico could win, assuming that Silat isn't too much stronger than when he fought Guts. Serpico could probably have beaten human Griffith in a 1-on-1 duel as well, Serpico's pretty damn amazing 1-on-1. Serpico vs Casca, Casca wouldn't stand a chance. Basically anyone who Guts beat pre-eclipse, Serpico could take out, with the possible exception of Silat and some of the other Bakiraka, and Wyald might've been a problem too. I don't think he'd last long against most of the "greater" apostles (Locus, Rakshas, Zodd, Grunbeld, Irvine, etc), and Guts would probably last much longer against a God Hand than he would, despite the pain from his brand. Griffith won't hurt Casca, remember how he saved her at the hill of swords? Guts and Casca's baby [which is still living inside him, or something like that] likely won't let him. Aside from that, and the fact that Griffith would likely sit back and watch instead of going after a harmless woman he has no interest in, it seems plausible. Forget all of this... Serpico VS Griffith? The real question is: Could Serpico take Isidro? Now THAT is a debate, because Isidro is clearly the greatest tactician in the series (after all, he uses cunning to throw things from a distance! ), and as we have seen with Luca's girls, he can only be distracted by women MOMENTARILY, unlike Serpico. Clearly, Isidro is superior, as he slays more trolls in volume 26 than Serpico, AND he snipes far more possessed occultists with rocks during the time when Griffith is being reincarnated. Consider, we've never seen Isidro entirely defeated in the series, unlike Serpico, who clearly lost to Guts, and Isidro did pretty damned well with that pirate. In short, Isidro is the ultimate strong one. That is not even close to accurate. Guts beat him with a stick, Schierke also defeated him several times. As far as throwing things Serpico has brought down Isidro and Guts with nothing more than a twig. Forget all of this... Serpico VS Griffith? The real question is: Could Serpico take Isidro? Isidro surrendered to Serpico without a fight. The only things he's really killed effectively so far are trolls, croc familiars and to an extent, Daka. Things that Guts goes through like he was picking daisies (if he could could pick 5 at a time). Serpico is too be feared no matter the numbers. And he does not need his wind gear. Doesn't need the cloak, and he can dodge the unrestricted DS and has proven it. Yeah, he's better than a group of common Kushan soldiers. We're talking about powerful warriors and apostles, though, aren't we? He also nearly lost his foot, without which he probably wouldn't even be able to continue (though they quit after that, anyway). Guts was also caught with his back turned, which is probably the reason that Serpico managed to draw blood on his first swing. It's entertaining to watch your fervor for Serpico's abilities, however lets face it: Serpico is never going to be as narratively important as Guts or Griffith. One can argue hypotheticals all they want but that won't change what has been written already. Serpico is a second tier supporting character at best. Isidro surrendered to Serpico because he knew Serpico stood no chance, not wanting to kill him and our boy Isi just doesn't deal with things that way, you know? Again, displaying more tact than Serpico. It's also amusing to me how you are telling me to "face it" to something I never said or implied otherwise, lol. My thinking it would be cool and possible for him to fight Griffith has nothing to do with me considering him the main character. While I am at it I'll try to face that the earth is round or some other things I've known and believed most of my life. Serpico is indeed a supporting character but as far as this line... "Serpico is a second tier supporting character at best." At best? really? He is only in more of the manga than any character besides the main three, and Miura saw fit to cover his backstory in depth starting from childhood. Seems like you're the one who would like to change what has been written. As you said though, you can't. Ok, I will admit it, Isidoro is the strongest character in Berserk. You were saying how he can only fight one opponent at a time, and that his wind gear is what gave him the ability. I agree with you completely he could not handle more than one apostle, and even then its an uphill battle for him. Nearly doesn't count for anything though, if it did then Guts would have died in volume 1. The fact he dodged a blow from Guts from close range means he would not get "torn through like any other memeber of the HICKS". Scratching Guts is impressive but god knows plenty have done it if you check out his scars so its not a huge deal. Scratching him and living to tell about it is another matter though. Serpico, I don't think many people would argue that they outright WOULDN'T want to see Griffith and Serpico hypothetically fight. I think most of the aggression you're encountering here is a direct result of the phrasing you used in one of your original posts - that Serpico is more powerful than "most every legendary hero in the Berserk universe." Surely you realize this is a pretty controversial statement. But who did you have in mind for these "legendary heroes?" You later excluded "80% of the apostles" (even though he's clearly not faring well against an anonymous one in a picture shown above), Boscone, Griffith ... even out of left field, FLORA! True, my statement was poorly thought out. I really meant humans, and the apostles are a little ify in my opinion whether it was before or after they used beherits that they gained fame. Grunberd though, I will concede pretty easily that his human form is more than Serpico can handle. Probably we can all agree though that most "legendary heroes" are nowhere near as good as the apostles, and particularly those apostles, at least I hope we can. Serpico was actually doing ok against that apostle you showed. I mean he did chop its nose off and was thus far unharmed, and it was a transformed apostle. Guts did about a thousand times better for sure though. Flora is way better than Serpico and I'd never say otherwise I tried to cover all the angles for clarification. I left off the Makara and Daiba though. Its not absolutely proveable but I would say Serpico is better than Bazuso, Adon, Samson, Casca, Azan, Silat and the like. I'm assuming there is more of similair ability to them. This is without magic. With magic I think he could beat some weaker apostles and magical beast, and stand at least a little chance against some tougher ones. Duel 1, Vol 19: Serpico corners Guts on the cliffs of Albion, and even with all the advantages he had, still fails to get the best of Guts. In the end, he manages to scurry away like a rodent only because Guts has better things to do, such as look for Casca. 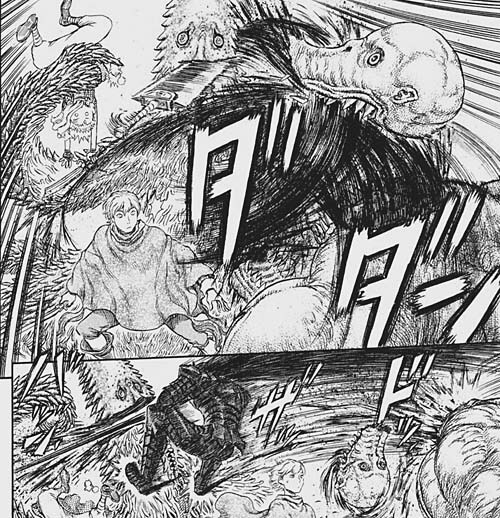 Duel 2, Vol 30: Serpico forces a duel with Guts in Vritannis, and even with the pillars to his advantage, and Guts severely hindered by his battered body, manages to survive because Guts still needs him in the band. These are two distinct advantages the vast majority of Guts' opponents never had. Actually, I said he is to be feared in a 1-on-1 battle, because that is what he is used to (dueling with nobles) Remember, the HICKS rarely saw combat, so there is no reason to believe he had ever seen combat against a group of enemies before meeting Guts. What I said may've been a little strong, but you know that he wouldn't have been able to block or parry the attack, he dodged it because he had to [with the wind equipment, it would be another story, and that is what I meant]. If Guts had swung two feet higher, "Serpico" would've just been another name on Guts' kill roster. Nothing to say there. The fact that Serpico lived shows that he's not as bad as your average soldier. First, Serpico escaped quite tactfully. I wouldn't say it's the bravest thing I've ever seen in a manga, but I think that calling it "scurry away like a rodent" is a bit strong. Second, Guts probably wouldn't have (intentionally) killed Serpico in the second duel anyway, he has no reason to. I think that basically anyone Guts killed while he was with the Hawks would be helpless in a duel against Serpico. A battle and a duel are pretty damn different, though. On the cliff, Serpico did escape on his own. When Serpico did scratch Guts at their first encounter and in the formal duel, he was "allowed" to live as you say though. I agree Guts could have killed him either of those two times if he persued it. Serpico did survive some attempts by Guts to kill him though, and based on skills he displayed VS Guts (and others) I would say he could defeat those others. I am really basing it on that. Guts has some pretty amazing counters to Serpico's moves. I just can't see Azan for instance pulling things off like catching Serpico's sword barehanded, or instinctively outwitting Serpico while in battle. Even in wits Serpico throws Guts off guard on occasion, but Guts is just too much for him. Aside from Guts Serpico handled the Tigers, daka, kushan, nobles, trolls, and spellcasters in an impressive manner. He has actually damaged a couple apostles without getting harmed even though he didn't get to finish the job, which I will grant he may or may not have been able to. I think we are going to find out eventually. Even just paying attention to the manga; Guts, Schierke, Daiba, and Ganishka have all noted Serpico, in terms of raw ability, wits, and magical talent. This is not as amazing as recognition from say, Zodd or Skullknight, but its still a good resume that relatively few could match. Well on your first point, I will just agree that is he to be feared 1 on 1 and that was what he is used to, and probably where he is at his best. Since then he has shown he can handle quite a few at a time though. He killed those 3 literally in a split second, and that was after staying up the entire night fighting ghosts. If Guts had swung 2 feet higher Serpico may have ducked instead. Aside from dodges he did show an ability to "surf" the DS, so he is fairly inventive, and seems to know what will and will not work. I don't think he is under any delusion he can parry Guts attacks, the mistake which was Griffiths downfall. Thats right. Whats been written, backstory or no backstory is that Serpico is not pivotal, to the overall story. If he were to get killed in your hypothetical fight with Griffith or perhaps sacrifice himself for Farnese, it would be sad but the story would easily move on. He is a second tier supporting character (I'd place him below Puck), he's not going to drive the plot any time soon. Its best you realize that and quit bitching about how I worded the obvious. Guess I missed the part where he deflected an attack that could have could have killed Guts, among about a dozen other things. Farnese would also be dead. Guts would be alone with Caska still... yeah you're right, he had no effect on the manga at all. An imaginary man just saved Guts from dying in a fight with Zodd that Guts WOULD have lost. Where did I ever claim Serpico to drive the "main plot". He does drive the subplots and contributes to the main plot. It's best you try reading the manga as well as my post again with your glasses on this time. It's rather hard to say this character could be that character, based simply on past performance. Could Boscone, Adon, or Samson have beaten Griffith? Maybe, but as they didn't actually fight, we simply will never know. And a single character's skill, talent, or ability, does NOT determine the outcome of a battle. Chance, circumstance, dumb luck (and of course causality ) usually determine the outcome of most pivitol battles in Berserk. When Guts confronted Griffith before leaving the Hawks, who's to say Griffith lost merely because Guts "had better skill" It was primarily Griffith's arrogance that cost him the fight. He underestimated Guts based soley on how they had fought in the past. Is Serpico stronger, more skilled, better than Guts? 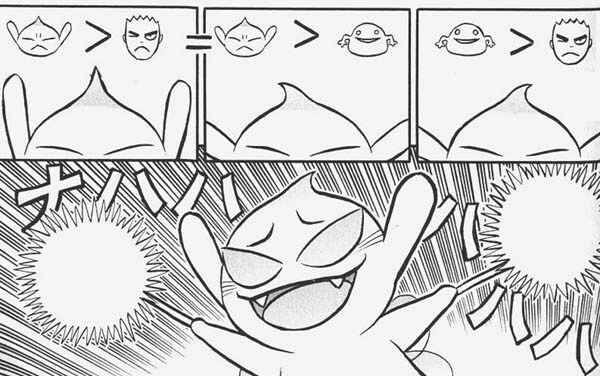 Miura doesn't seem to think so. Could Serpico beat Guts in fight? Why not? Just because he defeats him doesn't make Serpico a better fighter, it simply means the variables (and maybe causality ) where in his favor. I agree with you there. I think this line should be reversed though. Skill usually determines the outcome over luck. Even when there is some luck, skill usually plays the most part. Gatsu survived his first battle with Zodd just as much by his own skill and power as he did by luck. Without his skill he would have died; without his luck he probably would have died. As far as anything being possible, you're right... Adon defeated Guts and Caska at the same time due to their terrible fortune that she was PMSing next to a cliff. That is in part what I am getting at here. What I am saying is Serpico is more than skilled enough that if had a little luck he could potentially beat some apostles. As far as fighting a common or even a great soldier, his skill probably puts him in the top 1% of human fighters thus he will LIKELY win 99% of the time. Certainty in anything is unachievable.